I am willing to say that anyone who thinks the matter of whether paywalls will help news organizations find a prosperous future is settled is completely lacking in credibility. Specifically, the paywall cheerleading by Ryan Chittum and Dean Starkman of CJR is mystifyingly lacking of thoughtful analysis and skepticism. I won’t attempt to explain all the strained, mixed metaphors in the Chittum piece, but the “Allies” in this one are paywalls. If the war were over, I would not have received the email I did yesterday. Even if you take the most positive view of paywalls’ performance so far, we are a long way, measured in years, from establishing them as an important revenue source for healthy, growing media companies. Even if they start providing a consistent, significant revenue source, they will always be subject to disruption and competitive challenges. This is the silliest thing about Chittum’s war analogy: The Allies did win World War II. The digital marketplace is not a war media companies can win by dropping a new kind of bomb (I added that to Chittum’s metaphor, but subscriptions certainly wouldn’t fit there). The digital marketplace is a continual competitive struggle, where today’s victory becomes tomorrow’s vulnerability. When you think you’ve won, you’d better watch out. It’s the New York Times. Nothing that it does extrapolates to other news organizations. The gross revenue figure tells us nothing until the Times reveals how much it spent to develop its pay “meter,” how much it costs to operate and promote the paywall and how much its advertising revenue declines because of the traffic it loses from the paywall (or how much extra revenue it gets because advertisers value subscribers more than they value the non-paying audience). We don’t know whether the net revenue to the Times from its paywall is $90 million, $10 million or even a net loss. The Times announced this week that it is attempting to buy out 30 more journalists. I won’t call a company’s strategy successful until the business is growing, not cutting. We’ll never know what kind of revenue the Times might have generated if it had spent the millions that it poured into the paywall on more forward-looking strategies. I hope for success for every paywall (and every other business strategy tried by news organizations), but I am skeptical that they will work and am frustrated that the news business is not doing a better job at developing more forward-looking revenue streams (which the news business will need, regardless of whether paywalls are generally successful). My skepticism about paywalls is not based on jumping to conclusions from limited data from the recent wave of metered paywalls. It is based on years of failed paywalls. I’ve spent lots of the past seven years studying, advocating and working to implement different models for the news business. I might act on occasion like I know more than I do, but I’m humble enough to admit I don’t know what’s going to work. I’m willing and hoping to try a lot of things, but I don’t know yet which will succeed, and I will try to take any successes with huge doses of humility and caution, because success in this dynamic market may be short-lived. I suggest you bring a big dose of skepticism to anyone who thinks they know. This ain’t about religion. Mathew Ingram makes an excellent point about how silly it is to portray this debate in religious-war terms. When I called Chittum on that point in a comment on his post, he used the they-started-it response, noting religious references made by two paywall skeptics, as though that justified his “freehadist” reference. I have objected earlier (in this blog and in a comment on an earlier CJR post by Howard Owens) to religion references from both sides. Beyond being offensive to people who are actually religious, they just aren’t accurate to this dispute. I genuinely hope paywalls are successful, and religious zealots simply don’t do pray for success for people they disagree with. I should add that I’m sure that Chittum and Starkman will applaud — perhaps belatedly and begrudgingly, but they will applaud — tangible success in developing other revenue streams when paywall skeptics succeed. The alternative to paywalls is not reliance on CPM ads. As I replied to an anonymous CJR commenter claiming to be a Times staffer, I have blogged about plentiful new ideas for revenue that newspapers have not sufficiently tried yet. And others, such as Jeff Jarvis and Steve Outing have suggested plans such as a reverse meter or membership that I think have notably greater potential than paywalls. Lots of digital businesses succeed without paywalls. Chittum mischaracterized my arguments against paywalls, but I won’t respond to his individual points. I’ve made my points many times and I believe they stand up well against his. But I will note that, while pretending to shoot down the “straw man” arguments against paywalls, he ignored what I consider to be the most compelling argument: Thousands of digital businesses are thriving without paywalls. In fact, about the only people repeating the fiction that it’s tough to make money online are those in the newspaper business. 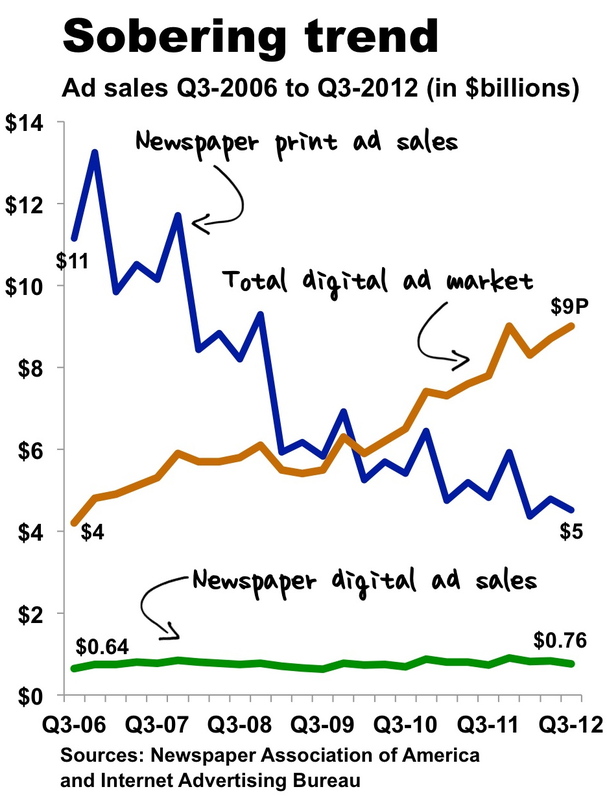 Alan Mutter’s graphic below drew some attention to the relatively flat green line representing newspapers’ online ad sales. That’s the performance of newspaper companies in the digital market. But the potential? That’s the rapidly rising brown line (and that’s just the advertising potential).
.@dbrauer No, I think paywalls are generally dumb (some premium content might work). I just don’t think I know all the answers. As I find myself reading more and more publications via their free apps, I can’t help but wonder why we are still arguing about paywalls. I enjoy reading your analysis and commentary. Although I am not a journalist or, in any way, associated with the industry, I have always had an interest in the profession. It began with my first “real” job as a copy boy for the Portland Press Herald/Evening Express while I was in high school. I am sad to see so much deterioration in newspapers everywhere. I have wondered why the online versions of newspapers and blogs (like yours) does not make use of the expanse of blank gutter space on left and right margins. I have suggested, more than once, to a few moderators at newspapers I read on-line, that they explore using that space for floating ads. Advertisers may like to be able to use those intermittent payoff teasers such as “click the red button now for a 15% off coupon” or some diversionary humor where an actual report on number of ad clicks can be measured. Despite the risk inherent in association with ugly, hateful commentary, a simple “This comment thread is sponsored by……” might be seen as a useful way to keep a brand in front of an active, engaged readership. In truth, the value may be even greater on those articles which will, by virtue of controversy, generate the most reader commentary and repeat visits. I would be interested in hearing your view on this. I think paywall business models fit Einstein’s definition of insanity. Apple knows how to gain a slice of your fixed discretionary income. If I was a media company, I need a micropayment system, that can charge upto $5 per week. Give your readers $5 credit to get started, deduct a dime for each story and remove the ads for them. That way the readers get value and there is a direct correlation between a story of interest and a dime. A pay wall is asking for money based on future uncertain value. I need to think about that one a while, but my initial reaction is skeptical. And as for Apple, I never said paywalls were a bad idea for Apple. Or Press Plus. I agree there needs to be some type of insentive. And there’s absolutely a disconnect between readers who want good content, but simply don’t want to pay/ can’t afford/ or don’t see the value in the price. I’ve paid for subscriptions to things that I’ve cancelled even though I liked what it offered because I wasn’t taking advantage of it or using it. I’ve continued my subscription to things that are either mailed to me, emailed to me, or I’m sent reminders or insentives to continue my use of the product. As much as I hate to admit it, there needs to be more marketing around paywall structures to keep subscribers interested if it’s going to work. There’s one (important) thing that seems to be continually overlooked in this debate: the internet IS NOT FREE., Most of us pay $45 (minimum) for high- speed broadband internet access. In the past, the internet was like a giant bookstore where you paid a fee to walk through the door and, once in, you could read everything you wanted for as long as you wanted. So, if someone is looking at a newspaper website, they have already paid someone, somewhere for that privilege, Newspaper are asking people to pay ANOTHER FEE on top of what they have already paid to walk through the door. This matters I think, much more than anyone is willing to admit and is a factor in whether or not people will want to pay for individual newspapers. on December 18, 2012 at 4:13 pm | Reply » Paywalls são inevitáveis? For new ideas for a Paywall 3.0 that can change the game by totally re-architecting customer relationships, check out FairPay. FairPay reinvents the architecture of digital commerce to focus completely on the customer relationship. It does this by shifting from a short-term transaction view of pricing to a long-term relationship view, and empowering the customer to engage in meaningful “dialogs about value.” It is this FairPay dialog that generates the price, with deep participation by the customer. FairPay works as an adaptive value discovery engine that sets the price — and how the product is offered to the customer — to match what the individual customer wants and values. For details of how this extends ideas from Zuora about “Paywall 2.0” check out my blog post at http://www.fairpayzone.com/2013/03/paywall-20-and-paywall-30-focus-on.html.